Newfoundland, Canada has a storied history of stunning songwriters, poets and players. Over the course of the last decade The Once have writ and knit themselves into that story. With the release of critically acclaimed fourth album Time Enough earlier this year, East Coast Music Award (ECMA) winners and JUNO Nominee’s, The Once announce their return to the UK for a string of tour dates from January 2019. The Once continue to stay true to the root strength of their harmony driven sound, while extending the borders into fresh yet familiar territory. They craft a sonically understated, but emotionally fulsome sound that accomplishes what they’ve always done so well: stun listeners with perfect vocal harmonies, thick enough to stand on.Building on the wave of creative energy that defined their last album, Time Enough is a striking and subtle sea change for the band. The story of The Once is one of growth, propelled by the rare chemistry that comes from a decade of writing and touring together. 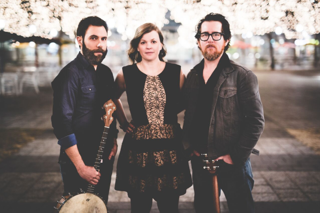 Their songs have been placed in international film and television, they have YouTube videos with millions of hits, and there’s a trail of trophy nominations and wins from the East Coast Music Awards, the International Folk Music Awards, the Canadian Folk Awards, and the JUNO Awards in their wake.